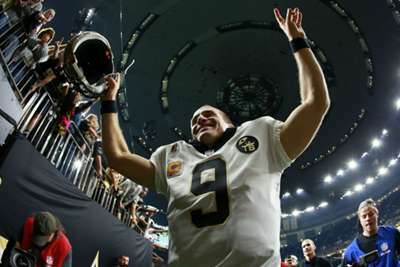 New Orleans Saints quarterback Drew Brees believes there is still more to be done after becoming the NFL's all-time passing leader. Brees made history in Monday's 43-19 win over the Washington Redskins, the 39-year-old star surpassing Peyton Manning's record of 71,940 yards in the second quarter. The Super Bowl champion and MVP finished 26-of-29 passing for 363 yards and three touchdowns in his record-breaking performance to move ahead of former Indianapolis Colts and Denver Broncos QB Manning. Reflecting on his milestone achievement afterwards, an emotional Brees held back tears as he told ESPN: "There's so many people that are responsible and had a hand in that. "The two people that are most responsible for my football career, early on, my mum and my grandfather, are up in heaven. "There were a lot of people I wanted to prove right and make proud, but none more so than them. I know they are watching down on me." Brees added: "I am just so grateful, so grateful, for the opportunity to play this game, and to play it for so long, to have the team-mates that I have and the New Orleans Saints organisation and this great city and this great fan base. "It's really been a dream come true. Just really proud and really grateful. Maybe we will reflect on it a bit more when my career is done. I still feel like there's work to be done." "I don't know if it will ever sink in. I just love playing the game. I didn't set out on this journey to break these records," he continued.